It is an elongated cavity in the vertebral column. Being located 1 above the other, the vertebral column is composed of 33 sections/ vertebrae. They’re grouped in line with the body regions as follows: 7 cervical, 12 thoracic, 5 lumbar, 5 sacral and 4 coccygeal vertebrae. Generally, every vertebra is composed of 2 parts which enclose between them the vertebral foramen: a ventral body and a dorsal neural arch. 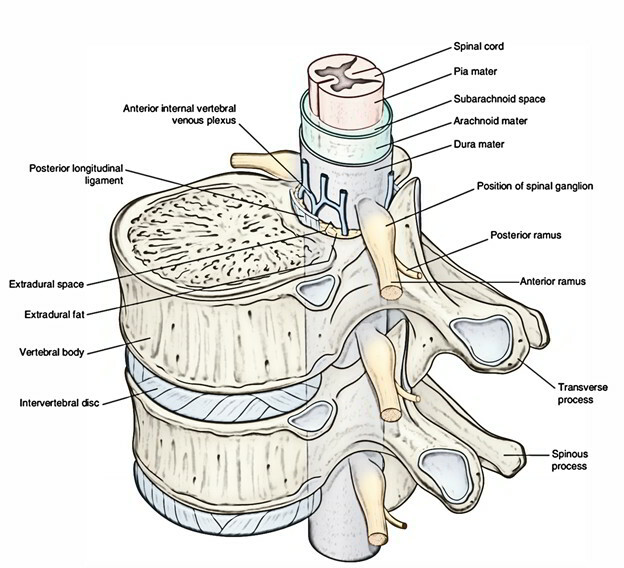 The entire series of vertebral foramina being located 1 above the other when the vertebrae are held together in the vertebral column are called vertebral canal. The vertebral canal is a smooth-walled space bounded anteriorly by the vertebral bodies, intervertebral discs and the posterior longitudinal ligament, in human body both in vivo and in vitro; and posteriorly by the vertebral laminae and ligamentaflava. On every side, it’s bounded by the pedicles of vertebrae with intervening large intervertebral foramen. The vertebral canal is continuous above with the cranial cavity and below with the sacral canal. The latter is thought to be the part of the vertebral canal. The vertebral canal includes spinal cord encompassed by its meninges. The bony wall of the canal is divided from the spinal meninges by the epidural space. Spinal cord with its nerve roots.